PAY IT FORWARD! – It Works For Bobbi! Published on April 9, 2008 August 9, 2016 by Bobbi-Jo G.
ETA: All you do here is leave a comment and you are entered. I will draw 3 names from all the comments and mail you something I made from the heart 🙂 If you are one of the winners, you need to then do this same contest on YOUR blog – draw 3 names and send them something (bought or handmade), and so on. 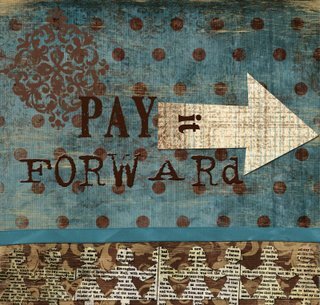 In other words….Pay it forward! Does this make sense? I’ll be announcing who the random winners are. (not telling what – who doesn’t like surprises). that the random generator didn’t pick your comment. But, feel free to carry on this contest—win or lose. Only comment on this post if you are willing to play the game. Previous Soft Light Tutorial and fun stuff! I saw that you won Bobbi! Congrats! What a fun thingy!!! I just found you again today! What fun catching up! Wow…I have been stalking your blog as I learn how to navigate photoshop and have gotten totally hooked on reading about your church and your family and all of it. So, WOW I can’t imagine winning something you would make with a family picture! I would drop over dead–hee hee! I will definitely keep this going if I were to win bc it just sounds like pure fun! Count me in! I LOVE contests…even though I never win. But what a good idea. I’m going to do it on my blog! OOOH Im in. Any surprise from Bobbi is bound to be awesome! Woohoo! I love fun contests like this one! And anything made by you would be totally fab!!! I have wanted to have another contest on my blog so this will be the perfect reason!!! Thank you for the great tips! I’m not sure how I found your blog, but I sure am glad that I did!